We observe Veterans’ Week from November 5th to 11th. It is a time to remember the courage of our veterans and the sacrifices they made while serving our country. During this week, many events are planned to honour veterans and those who continue to serve in the Canadian Armed Forces. Over 2.3 million Canadians have served in the military, and over 118,000 have given their lives so that we may live in peace. Many who do return endure the mental and physical scars of war. On Remembrance Day, and during this week, we remember the courage and selflessness of these individuals, and we acknowledge our responsibility to continue working for peace. Take some time to research why Remembrance Day is important. A great resource for information about Canada’s military history is www.veterans.gc.ca. Check out the Rememberance Timeline. 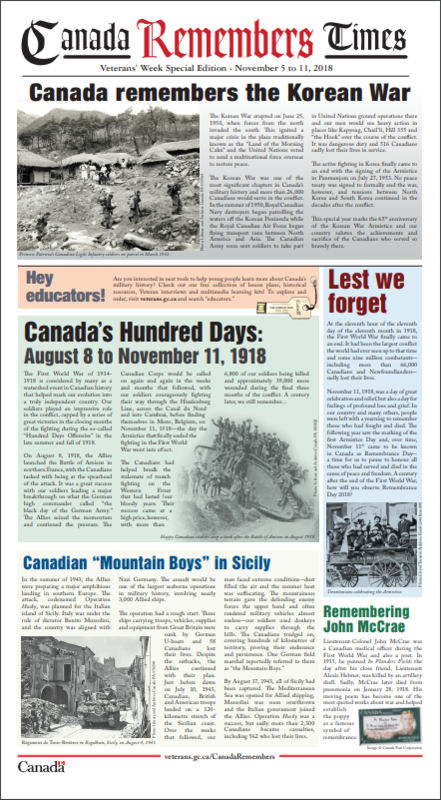 Canada Remembers Times (2018), is a learning resource designed for students in grades 7–12. It includes stories about Canada’s efforts in WWI, WWII, and the Korean War, as well as information about post-war Canadian Armed Forces efforts. Send a message to those currently serving in the Canadian Armed Forces to thank them for their dedication and sacrifice. Write to the troops. Flowers can symbolize honour, respect, and remembrance. Try planting a Garden of Remembrance this year — virtual or real! Learn more. Social media is a powerful way to converse about Veterans’ Week. You can change your Facebook cover photo, put a poppy on your profile picture, or use #CanadaRemembers in your posts. See more social media ideas for Veterans’ Week. Many events occur during this week to commemorate Remembrance Day. Find one in your area. Visit Ways to Remember to see other ways you can get involved.